Cathie Filian: Recipe: How to make frozen oatmeal at home for .12 cents a serving. 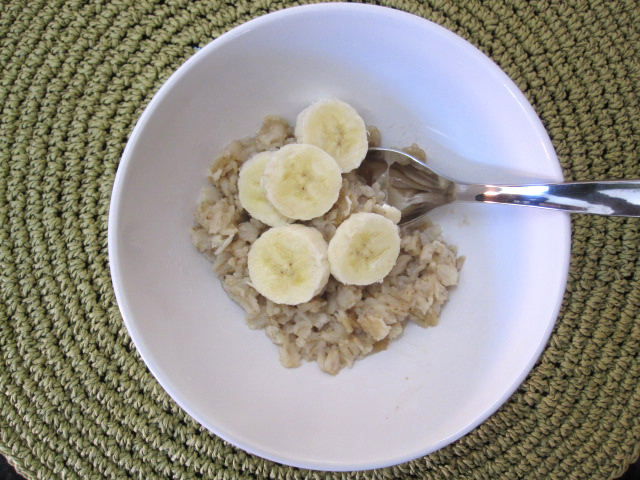 Recipe: How to make frozen oatmeal at home for .12 cents a serving. DIY Frozen Oatmeal * .12 cents a serving! Our mornings have been pretty rushed lately....so in an effort to make our mornings go a little smoother and our bellies happy with good food - I decided to make our own version of frozen oatmeal. We have tried various brands of frozen oatmeal and they are pretty good, quick to make and pretty pricy. 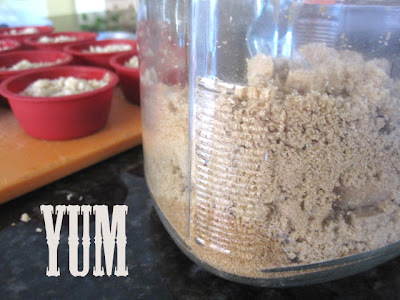 I figured I would give a DIY version a whack and see how it tasted.....WOW - it is good and so inexpensive to make. I figure 12 quick breakfasts cost us $1.50. That is about .12 cents a serving. Eddie loves them and it is just enough food to get him going. We have been considering 1 frozen disk a serving - of course you could use two disks for a bigger bowl. 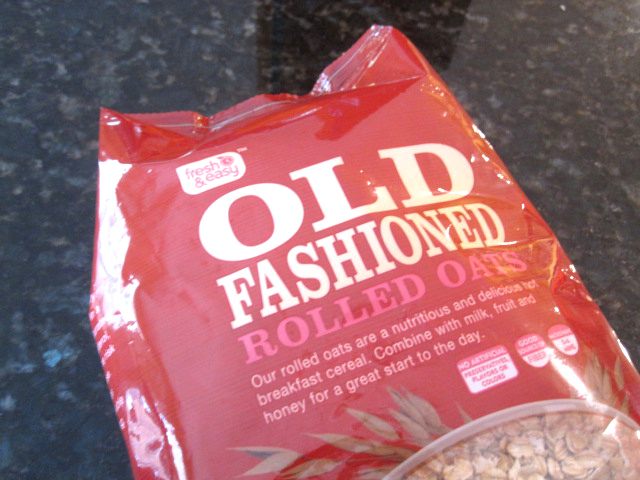 We used Old Fashion Rolled Oats from Fresh and Easy. Next time I am going to make steel cut oatmeal. We cooked as per the package instructions. Cook via Package Instructions for the brand you choose. Place silicone muffin cups on a cookie sheet or cutting board. Fill the cups 1/2 way full with cooked oatmeal. You can add some mix-in prior to freezing. We added a spoonful of brown sugar. Top off the cups, cover with cling wrap and place in freezer until the cups are frozen solid. 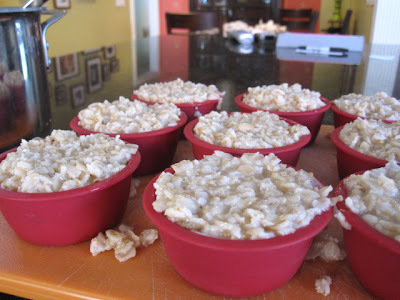 Pop the frozen oatmeal from the cups and place in a zip-top baggie for storage. 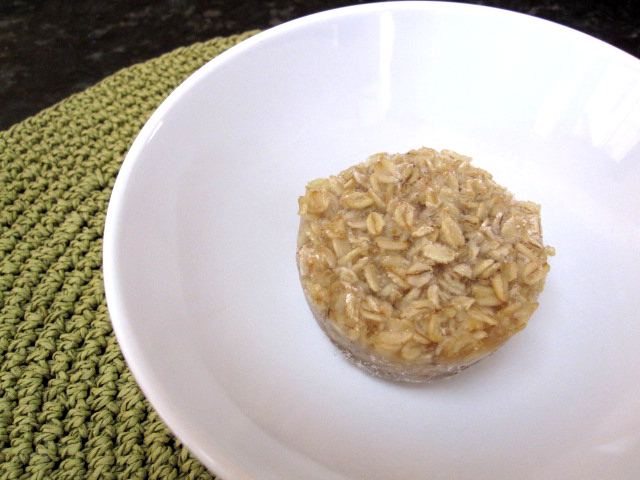 Place a frozen oatmeal disk in a microwave safe bowl. Microwave for 2 minutes. Remove and stir. Microwave for an additional 30 seconds. 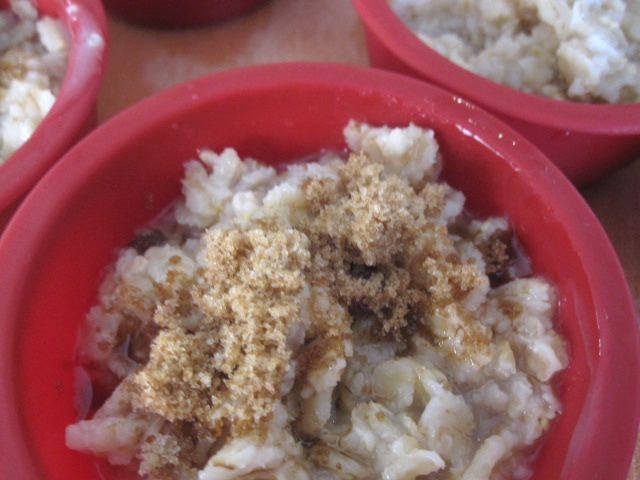 Top with milk, fruit, etc. and ENJOY! Thanks for this post! I don't have a problem making regular oatmeal in the morning but the steel cut oats remain on the shelf due to cooking time. You are so welcome! They are really delish! Thanks! Great idea. Where can I get those nice sturdy looking silicone muffin cups? I got mine at Target years ago. I have seen good ones at World Market/Cost Plus. I bet Wilton has some good ones!!! Michaels has lots of Wilton products. 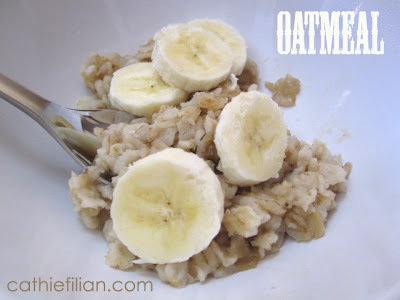 I like this idea, it will work not just for oatmeal but virtually anything!!! I have been thinking about snack sized pasta with sauce, mini soups....it is endless! we did this same idea with chicken burrito filling, makes it super easy to take burritos to work with me for lunch.